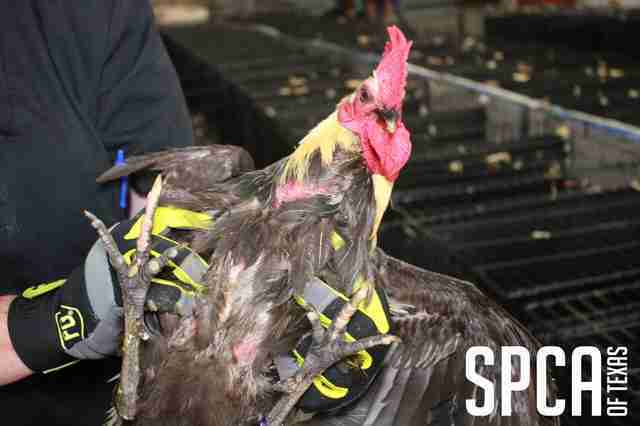 They were fighting roosters — and they'd already been through so much. Late Tuesday night, a police officer pulled over a van for a traffic violation. But what started as a routine traffic stop turned into something else altogether — when the officer opened the back of the van, he found 63 roosters and hens packed into boxes. Finding birds in the back of a van may not seem that extraordinary to some, but the officer was trained to know otherwise. Upon closer inspection, the officer found razors, gaffs (long, dagger-like objects that can be attached to roosters) and other cockfighting paraphernalia. 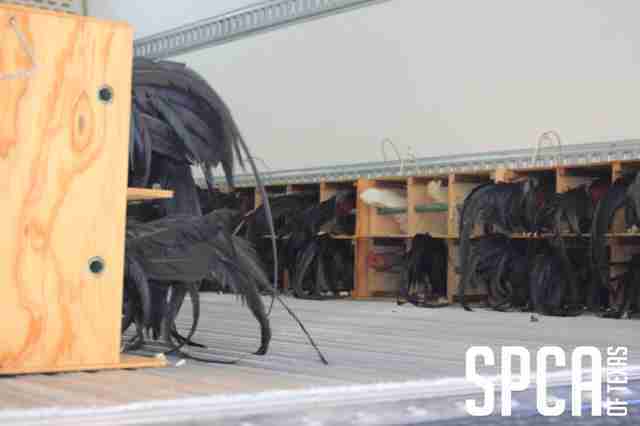 The officer also noticed many of the roosters were “dubbed,” meaning that their combs (the flap of red skin on top of their heads) and wattles (the red skin beneath their beaks) had been removed, which was another sign the birds were used in fighting. 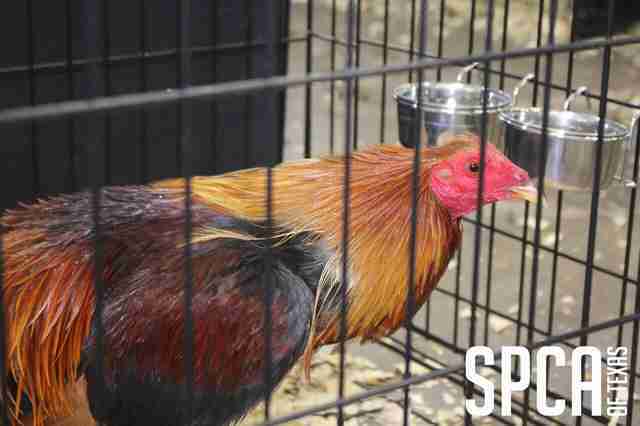 Cockfighting is a cruel, illegal "sport" where people take two male roosters and force them to fight one another — usually until one rooster kills the other. As the birds battle to the death, spectators place bets on which one will win. While it’s natural for roosters to be combative with one another for food and mates, birds used in cockfighting are selectively bred to be more willing to fight, Leighann Lassiter, animal cruelty policy director for the Humane Society of the United States (HSUS), told The Dodo. And their lives get worse. Cockfighting birds are often injected with adrenaline-boosting drugs or steroids to make them unnaturally aggressive so they’re willing to fight to the death, and they’re also put through torturous training designed to make them combative. “They go through a physical conditioning regime called a ‘keep’ for about two weeks before they plan to fight,” Lassiter said. And when the birds eventually fight, they sustain horrific injuries — if they’re not killed. When razor blades are involved, the fights are bloodier and quicker. 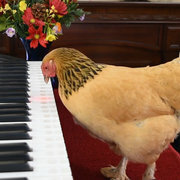 While the average lifespan of a cockfighting rooster is unknown, it’s likely not long. When roosters are properly loved and cared for, they can live up to 10 years and often become quite affectionate toward their humans. 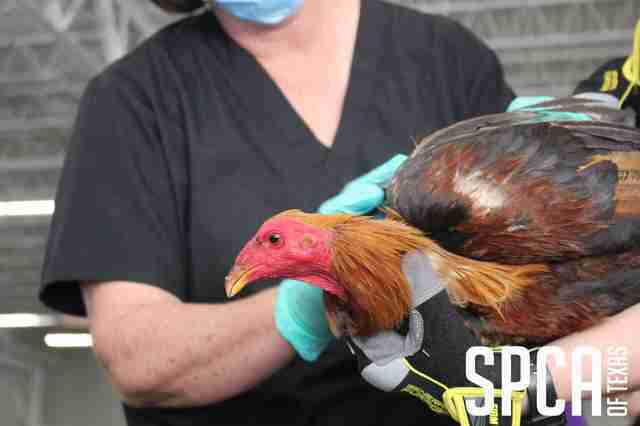 While these roosters have known anything but love, their rescuers are working hard to save as many of them as they can. In the United States, cockfighting is illegal in all 50 states, and a punishable felony in 40 states. The officer confiscated the animals and arrested the driver. 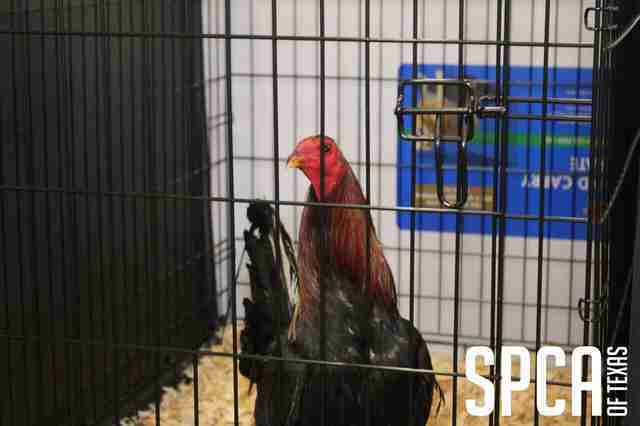 The officer then called the SPCA of Texas, which was able to relocate the birds to a place where they could be cared for. Out of the 63 birds in the van, 55 of them were roosters and eight were hens. While only the males are used in cockfighting, the females were probably kept for breeding purposes, according to Davies. 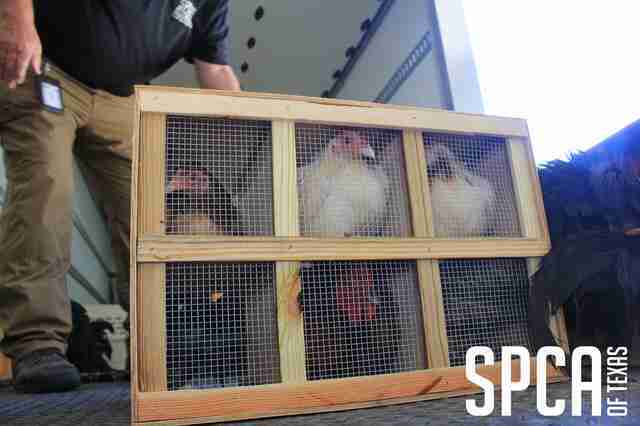 Staff members from SPCA of Texas transported the animals to an undisclosed facility in Texas. The exact place can’t be revealed as people involved in cockfighting have already tried to steal back the birds so they can continue using them in fights, according to Davies. 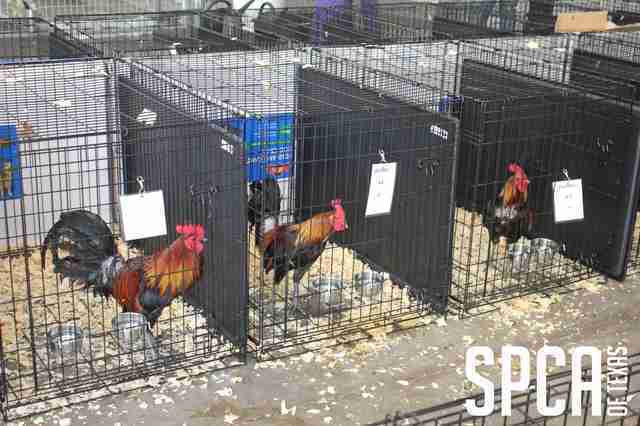 Since the roosters are so wired to fight, they have to be kept in separate kennels — and to minimize distress, the rescuers are even making sure they can’t see each other. 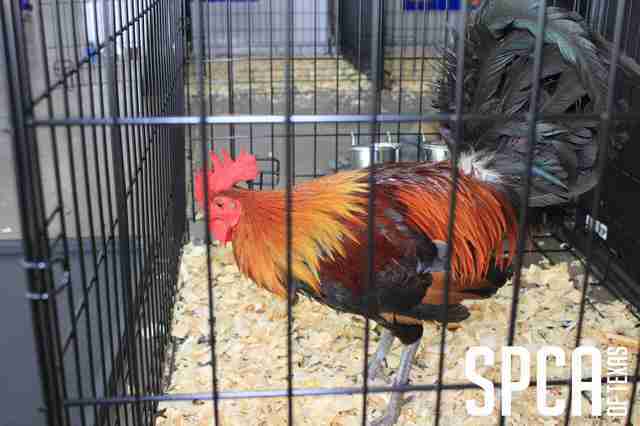 Sadly, it’s extremely difficult to rehome fighting roosters since they’re capable of fighting with other birds. That said, Davies said they will do everything they can to find the roosters and hens new homes. 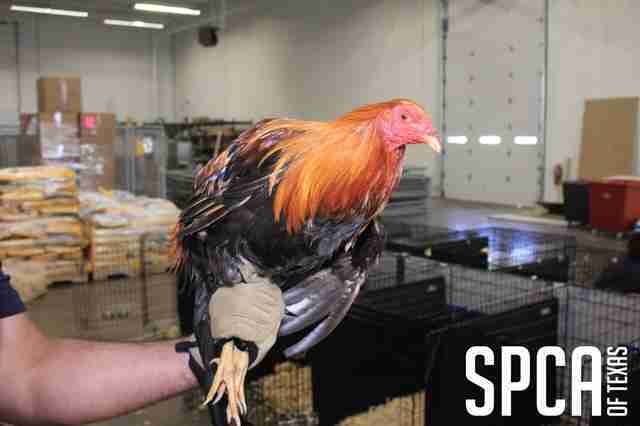 To help rehabilitate these former fighting roosters and try and find them homes, you can make a donation to the SPCA of Texas.